The tools I use when working on my car. You need certain tools to do any work on a car. This pages lists the tools I found useful when working on my DeLorean. I am not a professional mechanic, and I'm learning as I go, so this is very much a hobbyist's point of view. These aren't necessarily the best tools (in fact, they are often the cheapest tools that get the job done), but they worked for me. I decided to include make this list because it would probably be helpful to people trying to do their own repairs and those following my Repairs and Maintenance blog. My philosophy on buying tools is that if it's the first time you've ever bought this particular tool, just get the cheapest one you can. You don't really know what need at this point, other than something to do the job. You probably aren't familiar with all the features they have or even what features you'r looking for. You might only use this tool a couple of times ever, so there's little value in spending a lot of money on it unless you're a professional. If it later breaks or you decide that the tool quality isn't good enough, you now have enough knowledge to know what you need when shopping for a better version of the tool. This comes from the experience of my old philosophy: buying the best I could afford. I eventually realized I was wasting money, as the extra features or improved quality simply didn't matter when I only used something three times a year and never took advantage of the extra features. Buying a cheaper tool helped me save money and learn which tools I use enough to make it worth upgrading to better ones. It also may save you money in the long run, since even cheap tools will last a long time if you don't wind up using them very often. 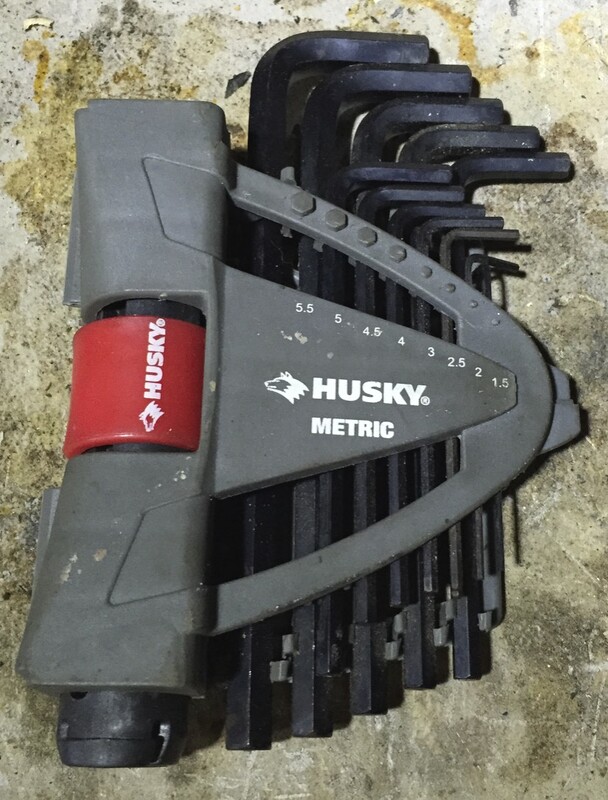 The majority of the tools on this page are under twenty dollars per tool or cheap set of tools, but others like torque wrenches and larger tools like creepers can go over a hundred dollars. I usually order from Amazon, or pick up tools from my local Harbor Freight, and sometimes local hardware stores. Still, you're looking at spending a couple hundred dollars for the basics. When looking for tools to buy, adding the word "automotive" to your search can sometimes help. For examples, searching for "picks" will give you a lot of hits, but "automotive picks" will find those better suited for engine work. Also, adding the word "set" to your search (i.e. : "automotive pick set") can help you find sets of tools, which is often cheaper than buying them individually and more usual than having a single tool only to find out it's not quite long enough or the right size when you need it. I prefer goggles because I wear glasses, and because they completely cover around my eyes so nothing can get in around them. These become important if you have to cut off bolts with a Dremel, for example. I don't like the idea of damaging my ears while using any power tools, so I wear muff-style hearing protectors when I use anything loud. You should have at least two fire extinguishers in your garage, especially if you're dealing with oil or gasoline. These should be tested to ensure they are fully charged and operational. Muff-style hearing protectors and safety goggles. Two fire extinguishers. The one in the back is slightly discharged, so I got a second one to be sure I'm safe. There are a few key tools you'll need to do real car repairs. Start with this and get the other tools as you need them. On the DeLorean, this is primarily a metric set, but a combination metric/imperial set is usually a good thing to have. Common sizes will be 11mm and 13mm for many of the engine parts, but you'll want a range of sizes. You'll probably eventually want a second socket wrench as well. My set is about 20 years old now and has 5/8" and 1/8" drive as well as a bit driver handle and an extension. 1/8" is usually for 13mm and smaller, 5/8" from 9mm up through 19mm, and 1/2" for larger sizes, like the 35mm socket needed for the engine's main pulley cute. Again, metric sets are most useful on the DeLorean, but a combination of english and metric is useful. You'll want open end and closed end wrenches, as you'll have uses for both. Eventually you'll also wind up getting specialty variants like crows feet wrenches, offset wrenches, and so on to get to hard-to-reach bolts and nuts, but initially a basic set is fine. This is especially important when you're starting out, but I didn't get one for quite a while. Tightening bolts to the correct torque ensures that you don't strip the hole the bolt is threaded into, which you're very likely to do in the aluminum PRV engine. I have intact done so in the past. Now I have a torque wrench and make sure to use it when tightening as many bolts as possible. You can use the emergency jack that came with the car, but it's really, really tedious. You probably want to spend some money here to get a jack that can lift the car as high as possible with as few pumps as possible. The main trick is finding one that's low enough to fit under the DeLorean's 5" ground clearance, which usually means a racing jack, but you also want one that can lift as high as possible. I've sometimes had to raise the car with my racing jack, put it on stands, and then put boards under the jack and between the car and the jack so that I can jack it up even higher. It is incredibly dangerous to get under a car that is held up by a jack alone. You should always support it use jack stands, and always in pairs. Specifically, a flat head and a philips head screwdriver. You only really need one of each, as the screws all tend to be about the same size, but having a few sizes won't hurt. Wired lights are best, since you don't have to worry about the battery running out, but battery powered ones are handy if you expect to do repairs in the field, or if you don't want to the wire trailing behind you (although you'll want extras for when the battery needs to be recharged). LED lights last longest, but wired florescent lights seem to be brighter, although they seem to be hard to come by. Many cheap battery powered LED work lights are underpowered and not very bright, so you'll want to read the reviews and get the brightest you an find in your budget. My old socket set, which includes a wrench, bit driver, and metric and imperial sockets in multiple lengths and driver sizes. A wrench set with metric and english wrenches. One end of each wrench is open, while the other end is the same size but closed . My creeper (left), quick-lift low profile racking jack (right) and a jack stand (bottom). Two torque wrenches. The top one is for larger bolts that require more torque, while the bottom one is for small bolts and low torque. A simple set of "L" shaped Allen wrenches. These just make things a lot easier. We'll stay away from the "useful but generally impractical for most people" tools like a lift. At its simplest, this is a board with wheels that makes it easier to move around under your car. There are a lot of different styles of these out there. I started with a clamp-on one and moved up to a bolt-down one. These are handle when you have a part out of a car and have to remove a stubborn bolt or cut something, and you don't want it moving around while you do it. Your socket set probably came with one, but you'll likely want more so that you can reach harder-to-access bolts. These becomes handy as you start to have to remove and reinstall a lot of small bolts, like those on the timing cover. You first break the nut or bolt free with a wrench and remove it the rest of the way with the driver. Similarly, you can screw it on most of the way with the driver and then do the final tightening with the torque wrench. I found a home improvement style one I got at the hardware store to be most useful, but there are a variety of them out there, including sets of various length and with various pry heads. These can help to separate engine components, such as when removing the timing cover from the block, and to tension things the main belt by using it to lever out the alternator. Just metric is fine. This becomes essential once you start doing engine work, as you'll need it to adjust the fuel/air mixture on the fuel distributor, and when replacing the water pump or the rear main seal. I have a set of "L" shaped wrenches, but the straight wrenches that fold into the handle should work just as well. I believe 5mm, 5.5mm, 6mm and 7mm are the most useful sizes here. Locking pliers ("vice grips" are the brand name) are like normal pliers, but they lock closed to hold tightly onto a part. They come in standard needle nose pliers styles and bolt head styles. Very helpful in retrieving lost parts, especially if you have a a set of long-handle ones. Picks are helpful when cleaning the engine, removing the retaining clip on the angle drive, and just reaching into tight spaces. A set of picks with different ends on them (straight, bent, hook, etc) tends to be a handy thing to have. A woodworking claw hammer will do for a lot of things, but a rubber mallet is very handy for tapping things into place. A four pound hammer can also be useful where you need a lot of force and don't mind breaking things. You can buy these as a specific thing -- they're basically just long socket handles without the ratcheting. However, I prefer a long pipe that slides over the socket wrench's handle. I have a few: a 6' long piece of pipe for breaking free larger bolts like those on the cylinder heads, and two smaller pipes that give me just a bit of extra leverage for smaller jobs. Often simply the diameter of the pipe is easier to hold onto than the thin socket wrench handle, and a wide small pipe can be used on a normal wrench as well. Useful for gripping larger rounded parts when you don't need a large amount of torque, or simply don't have the right sized wrench and need to get a large bolt off. It won't do you any good on the main crank pulley nut, but I've made good use of them to get my angle drive nut off in the past. Various length of socket extensions and a socket wrench. Using a pipe as a cheater bar on the end of a wrench to make it easier to remove a spark plug. A home improvement style pry bar (left), a small foot pry bar (middle) and a long-handled pry bar (right). A short pick (left) and a series of long handle picks. From left to right, Philips and flathead screwdrivers, pliers, adjustable pliers, long-handled needle nose pliers, locking pliers (aka vice grips). Power screwdriver with 1/4" socket, 5/8" socket and philips screwdriver bits. A rubber mallet (left) and a four pound hammer (right). Very common on the engine covers. These 7mm bolts are quite hard to find, though. Also comes up a lot on the engine, including the starter mounting bolts. Comes up in a few places, such as the bolts that and those that mate the engine and transmission, and those that hold the flex plate/flywheel to the crankshaft. Some of the larger engine bolts, like the head bolts. The main pulley on the engine crank. A 36mm socket will seem to work, but it's really too large. This is the one you need to drain the oil. It's also used to drain coolant and in a few other places on the engine. A 5/16 square drive is nearly identical in size (7.935mm) and will work in most cases. All DeLorean vendors sell these, as they're often hard to source locally. As you start getting into the engine or pulling it and the transmission, you're going to start needing some more specialized wrenches just to get enough access to the nuts and bolts. I tended to pick these up when I needed them. Short versions of normal wrenches. Handy for tight spaces, like the fuel accumulator. Zig-zaged wrenches that help in situations where you can't fit a socket wrench or a normal wrench. These mount on the end of a socket wrench or socket extension and are useful in tight areas where a normal wrench or socket won't fit, and where there isn't enough room for an offset wrench. These are like normal wrenches, but the heads tilt. They can be helpful in tight areas or when the bolts is at an odd angle relatively to the space where you can turn the wrench. Some socket wrenches also have tilting heads. In general non-tilting wrenches are easier to use, but you can get into more areas with tilting ones. These are hard to find, but handy for removing nuts and bolts after they've been broken free, or installing them before torquing them, in situations where you can't fit a socket. The ratcheting action keeps you from having to remove the wrench after each turn. Various specialty wrenches: stubby (top left), offset (bottom left), ratcheting open ended (top right), tilt-head (middle right), and crows feet (right). Sometimes you won't quite know what's wrong with your car, so you'll need some tools to track it down. These tend to be a bit more expensive, since they are specialty tools, but often they'll save you a lot of time. Extremely useful when looking for coolant leaks, and a lot easier than trying to find them with the car running. I consider this essential when doing any cooling system work, and given how many cooling problems the DeLorean tends to have, it's not a bad idea to have one. This can help when trying to figure out if you have a problem with the compression on of one of the engine's cylinders. These kits are a pretty affordable (around $60), and can help you diagnose a blown head gasket or worn cylinder rings. Helpful for diagnosing problems with fuel system pressures. These can get expensive (around $200), so it might be better to have a shop do the test for you, or at least wait until you know you need it before getting one. This is an electrical diagnostic tool that you connect to the car’s battery. When the tip of the probe is touched to an electrical connection, it lights up green for for ground and red for 12v, or nothing if not connected. You can also apply 12v or ground to any circuit with this. It is extremely useful for testing the car’s electrical system. There are various versions of this tool from simple testers to full-feature multimeter functions. A cheap multimeter is helpful for diagnosing electrical problems, testing voltages, checking coil resistance, and so on. You can find a bunch of common parts from various auto supply stores that you'll need more often than not. Primarily for the car's coolant hoses. Usually you need to replace old hose clamps when working with the hoses. You can get an assortment that includes a variety of different sizes. This is one of those things that's nice to have in case you need an O-ring. They're pretty inexpensive and have a large assortment of rings, probably more than you'll ever need. For use with the electrical system, and only really if you want to have the nice, clean look of heat shrink on the ends of your connections. I like 3:1 shrink ratios, although 2:1 is fine too. Eventually you're going to hit some rusted bolts. These tools can help get them out. Your first tool should be any brand of penetrating oil. I use Kroil, but there are a lot of others on the market, like PB Blaster. WD40 is not a penetrating oil, and won't help remove bolts. These are vice grips with special jaws designed to grab onto a nut or bolt head. They can help if the head has rounded off of the bolt or nut. These look like sockets, but have a spiral that bits into the rounded bolt or nut to help remove it. Available at hardware stores, MAPP (methylacetone-propadiene) this burn hotter than a propane torch and can heat bolts to help break them free when penetrating oil fails. Oxyacetylene is another option, and often works better due to how much hotter it burns, but it's more difficult to come by (you have to find a welding supply shop for the oxygen and acetylene), a little trickier to use, and more expensive. When all else fails, you may have to drill the bolt out, especially a broken bolt. This is not an easy thing, and you'll usually need hardened bits to do it. Left-handed bits that you use with your drill in reverse help here, since you may get lucky and grab the bolt and spin it out. There are also bolt extractors that screw into the end of the broken bolt, but if you break that as well you're in a lot of trouble, as those are already as hard as any bit you can buy. This is mostly useful for bolts that go through a material, like those on that hold the fascia to the plate behind the bumper. When those bolts are rusted, it can be easier to just cut them off and replace them. An angle grinder will probably do the job faster than a Dremel, but the Dremel allows for more delicate work. This isn't an option for blind bolts, however, like many of those in the engine block. One trick I've seen done before is to weld a nut onto the end of a broken bolt, after which you can just remove it with a socket. It doesn't seem like this would work with oxyacetylene due to how much slower it heats the area (you might melt surrounding metal as well). I've never tried this before, but it looks promising. The trick is power -- MIG, for example, seems to require 240V, and even simpler flux core wire and arc welding require a 20A 120v circuit. After drilling out a bolt or screw, you'll need to tap a new hole of the original size. You can try to just use a tap and die kit, but often the threads are just gone. A thread insert like TimeCert or Helicoil has you drill out the hole to a slightly larger size and add a new insert into hole. This is more robust, although they can be a bit expensive.